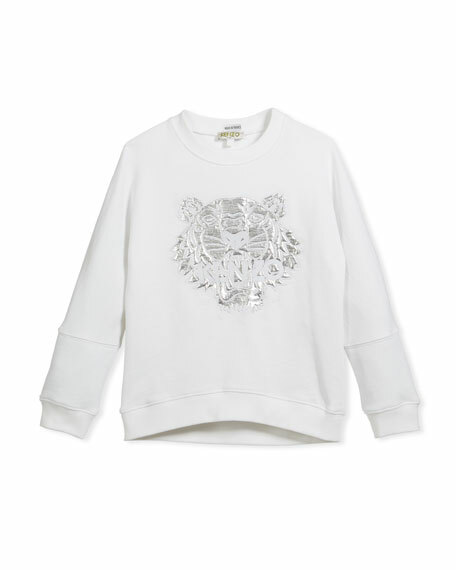 Kenzo sweatshirt featuring metallic tiger face embroidery. Banded collar, cuffs and hem. Bella Freud "Future" sweatshirt. Crew neckline. Super long raglan sleeves. Relaxed fit. Pullover style. Cotton. Made in Portugal. Model's measurements: Height 5'10"/177cm, bust 33"/84cm, waist 25.6"/65.2cm, hips 35.8"/91cm, dress size US 2-4/FR 34-36. Kenzo "Dragon" sweatshirt with embroidered tiger logo at front. Ribbed neck, cuffs, and hem. Crew neckline. Long sleeves. Relaxed fit. Kenzo "Dragon" sweatshirt with embroidered tiger logo at front. Ribbed neck, cuffs, and hem. Crew neckline. Long sleeves. Relaxed fit. Pullover Style. Cotton. Made in Portugal. Model's measurements: Height 5'10"/177cm, bust 33"/84cm, waist 25.6"/65.2cm, hips 35.8"/91cm, dress size US 2-4/FR 34-36. Kenzo classic sweatshirt with tiger motif. Crew neckline. Long sleeves. Relaxed fit. Pullover style. Cotton. Imported. Model's measurements: Height 5'10"/177cm, bust 33"/84cm, waist 25.6"/65.2cm, hips 35.8"/91cm, dress size US 2-4/FR 34-36. Kenzo classic sweatshirt with embroidered tiger logo graphic. Crew neckline. Long sleeves. Relaxed fit. Slipover style. Cotton. Made in Portugal.